I confirmed just how much of a nerd I am by working with Celestia for three days trying to perfect an add-on for the Jupiter System. Alan Stern and John Mather left the Science Mission Directorate over at NASA HQ. Very unfortunate. 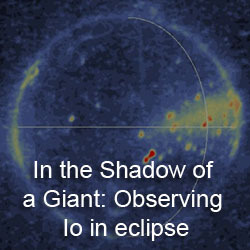 I went over a couple of Io-related papers in the April 2008 issue of the journal Icarus. 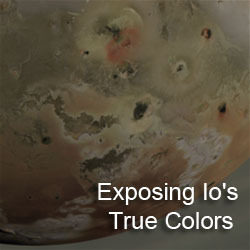 One covered the fate of impact ejecta from Io in the Jupiter system. The other covered laboratory spectra of polysulfur oxides and whether those materials can be found in Galileo NIMS spectra of Io. I uploaded a few mosaics I finished up on from Galileo's I24 flyby, including a nearly full-disk, clear-filter mosaic and a mosaic of the Amirani-Skythia-Gish Bar region of Io's leading hemisphere. So what do we have to look forward to this week? 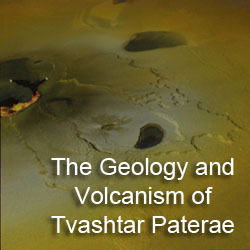 At the very least, new details on the Europa/Jupiter JSDT should come out of the OPAG spring meeting starting tomorrow in Boulder, Colorado. I also hope to finish up on the I24 mosaics and move on to finish up on I27.